You lost me when you started getting sloppy attaching the final material. You never answered questions like how to hang. Template? how did you cut the wood ? Omg talk about handy!! 💪🏼I love creeping other DIY-ers, I made my 3 panel headboard with paint canvases! what about the headboard? Is it a template? If so where did you get it from? This process is ridiculous. If you are selling product, which you are, well I guess you make your point. But there are so many ways to do this and not waste all this product. Crazy. Would Home Depot cut the plywood board like this if asked? What were the exact dimensions of the wood? Ive been looking for a video like this for quite some time and i absolutely LOVE hobby lobby! I will be doing this this coming weekend! Thank you! How long could I expect a project like this to take? Also, where did you find the fabric? I just bought this headboard with this exact fabric from a major home decor store, but if I can make it myself, why not save some money? This is perfect, the detail is phenomenal. 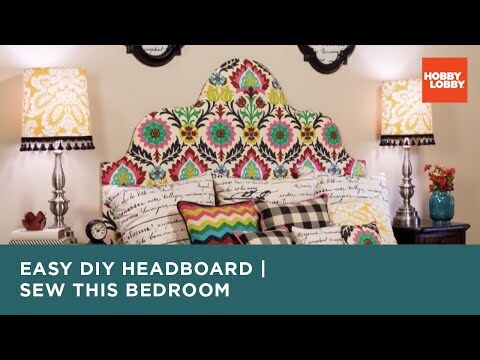 Thanks for your video, it has inspired me to make my own creative headboard!